The Best Birthday Parties are at Adventure Landing! Your special day is here, and Adventure Landing is the perfect place to celebrate! With tons of games, attractions, food, your group of eight or more will enjoy hours of entertainment. We’re all about enjoying yourselves and having fun! At Adventure Landing, we’ll create a birthday experience for you that will be memorable for years to come. Are you having a hard time planning your party? Our birthday party packages help take away the guessing and worrying. It doesn’t matter your age or your budget; we have birthday party ideas for everyone. Our team will worry about the set-up, clean-up, and everything in between. That way you can relax and enjoy the perfect day. When it comes to attractions and entertainment, Adventure Landing has something for everyone. Our games will make sure that your birthday is special. The packages we offer include selections of attractions that you can tailor to your needs! Our attractions are both indoor and outdoor, so you can have fun rain or shine! Our batting cage arena is one of the largest in the area with seven cages. Are you aiming to break some high scores? Head into our huge arcade to blast, drive, and dance your way to a new score. Come down to Adventure Landing and try out all we have to offer! Do you want to add on to your birthday party package? We offer add-ons for food, tokens, and even more attractions. We specialize in planning parties for any group, any age, and any budget. Our birthday party packages include a Party Captain who sets up and host the entire party. As your personal party planner, you don’t have to worry about any issues. We will make sure your birthday party goes off without a hitch. Adventure Landing is happy to accommodate every group. Set up your birthday party event today! 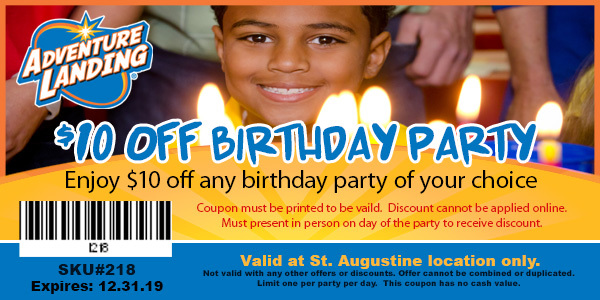 Plan your birthday party with Adventure Landing today! Get a jumpstart by booking online.